France 2 has revealed the line up of the Expert Panel for Destination Eurovision, the nations selection process for Tel Aviv. André Manoukian and Vitaa have joined the Expert Panel for Destination Eurovision. France Televisions has revealed the three members of the Expert Panel that will help to guide viewers through the 2019 edition of the competition. André Manoukian is a jazz singer and former judge on La Nouvelle Star (French Idol) between 2003 and 2016. He is no stranger to Eurovision, having commentated on the semi-finals in 2018. 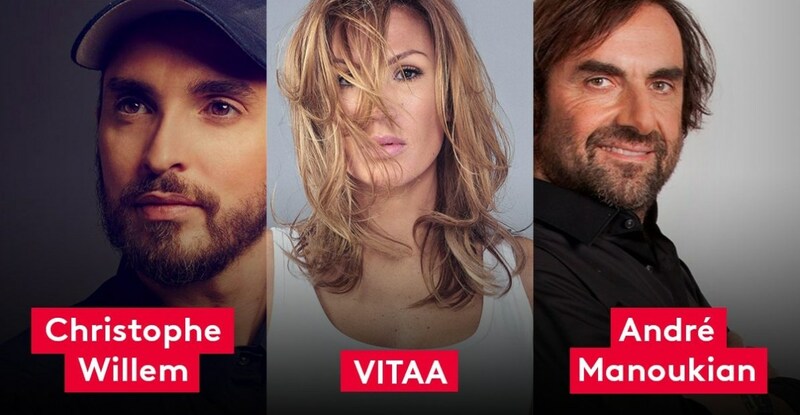 While Vitaa is the most played French female artist on the radio in 2018. Vitta also participated in Destination Eurovision last year as a songwriter behind Louka’s entry. Christophe Willem returns to the show for a second year running and is the only of last years judges to continue in the role. Last year Amir and Isabelle Boulay rounded out the three person panel and helped select the French entrant for Lisbon. Destination Eurovision was used for the first time in 2018, which featured two pre-recorded semi-finals and the live grand final. This was the first time since 2014 that France opted to hold a national final. The winner was chosen by 50% public televoting and 50% international jury. France was represented by Madame Monsieur this year in Lisbon, who placed 13th in the grand final with their song “Mercy”.